It’s the final round Day 1 here at YCS Chicago! From Wisconsin, we have Chia Vang playing a Kozmo Deck! He’s against Carlos Aquino all the way from the Dominican Republic with Sky Strikers! Vang won the die roll and began with a hand of Kozmo Sliprider, Kozmojo, Kozmo Tincan, Artifact Scythe, and Back to the Front. He Normal Summoned Tincan and Set his Trap Cards. In the End Phase he used Tincan’s effect, revealing Kozmo Dark Destroyer, Kozmo Dark Eclipser, and Kozmo Sliprider. Dark Eclipser was added to his hand, and the rest went to the Graveyard. Aquino started with Sky Striker Mecha Modules – Multirole and Sky Striker Airspace – Area Zero. Vang banished Tincan to Special Summon Sliprider, which Targeted Multirole. Aquino Chained Sky Striker Mecha – Widow Anchor from his hand, and Vang used Kozmojo to destroy Sliprider and banish Area Zero! Aquino lost both of his spells, and Sliprider Special Summoned Kozmoll Wickedwitch. Aquino played Sky Striker Ace – Raye and used it to play Sky Striker Ace – Hayate. It attacked directly, and its effect sent Sky Striker Mobilize – Engage! to the Graveyard. In Main Phase 2, he used Hayate to Link Summon Sky Striker Ace – Kagari and returned Engage to his hand. He played Engage to search out Sky Striker Mecha – Shark Cannon. He used Kagari to play Sky Striker Ace – Shizuku. He used Shark Cannon on Dark Destroyer, and Vang responded with Back to the Front to Special Summon the Dark Destroyer, destroying Shizuku! Aquino Special Summoned Raye from his Graveyard and passed the turn. Vang drew Kozmotown and activated it, adding Tincan back to his hand. He switched Dark Destroyer to Attack Position and moved to the Battle Phase. Wickedwitch attacked Raye, and Aquino used Raye’s effect to Special Summon Kagari, and added Engage to his hand. Vang banished Wickedwitch to Special Summon Dark Eclipser. He sent Dark Destroyer to destroy Kagari, and Aquino Special Summoned Raye in Defense Position. Dark Eclipser destroyed it. In Main Phase 2, Vang played Tincan and Set Artifact Scythe. He activated Tincan’s effect, and Aquino Chained Ghost Ogre & Snow Rabbit to destroy it. The Tincan effect still resolved, adding Sliprider to Vang’s hand and sending Kozmoll Dark Lady and another Dark Destroyer to the Graveyard. Aquino played Terraforming for Area Zero. Then, Engage got Multirole and let him draw a card. He used Foolish Burial Goods to send Metalfoes Fusion to the Graveyard. He played Multirole and Area Zero, then Normal Summoned his last card, Raye. He used Area Zero on Raye, then Chained Raye’s effect to Special Summon his third Kagari. Area Zero added Hercules Base to his hand, and Kagari added Engage back to his hand. He played Engage to search for Sky Striker Mecha – Hornet Drones and draw a card. He used Kagari to play Hayate and equipped it with Hercules Base. He had Multirole send Hercules Base to the Graveyard, and it recycled his Link Monsters. Hayate attacked directly. In Main Phase 2, Aquino used Metalfoes Fusion to draw a card. 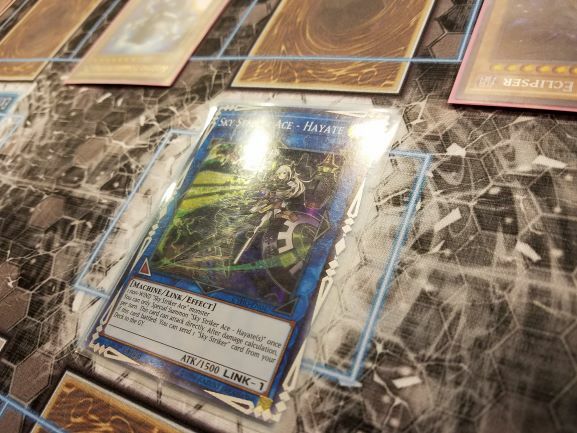 He Set one card in his back row, then used Hayate to play Shizuku. In the End Phase, Multirole Set Engage, Widow Anchor, and Shark Cannon on the field. Then, Shizuku added Sky Striker Mecha – Eagle Booster to his hand. Vang drew Back to the Front. He used Kozmotown to add Wickedwitch to his hand and Normal Summoned it. Dark Destroyer attacked Shizuku, and Aquino flipped Shark Cannon to Special Summon Dark Destroyer from Vang’s Graveyard, then Chained Widow Anchor targeting Wickedwitch. Vang Chained by banishing Wickedwitch to Special Summon Sliprider from his hand. Dark Destroyer wiped out the Sliprider, but Sliprider took out Multirole. When Sliprider was destroyed, it Special Summoned Kozmo Farmgirl. After all that, there was a replay. Vang had his Dark Destroyer attack the other Dark Destroyer. Vang’s was weakened by Shizuku so it lost the battle, and Vang Special Summoned Kozmo Forerunner. Forerunner attacked and destroyed Shizuku, and Aquino Special Summoned Raye. Vang then sent Dark Eclipser to attack Dark Destroyer – Aquino used Enemy Controller to Tribute Dark Destroyer and steal Farmgirl for the turn. Dark Eclipser then attacked Raye instead, and Aquino had Raye Special Summon Kagari and add Multirole back to his hand. Dark Eclipser had yet another replay, and finally attacked Kagari and destroyed it. Vang Set Back to the Front. Aquino played Multirole and flipped up Engage to add Sky Striker Maneuver – Afterburners! to his hand and draw a card. Vang flipped up Back to the Front to bring Sliprider back and destroyed his Set Artifact Scythe! He used Scythe’s effect and Special Summoned it, locking Aquino out of the Extra Deck for the turn. Aquino used Ghost Ogre & Snow Rabbit to destroy Scythe but the effect still resolved. Aquino played Afterburners to destroy Farmgirl and Kozmotown. Kozmotown’s effect activated, and Aquino responded with Shared Ride. Vang added Kozmo Strawman to his hand. Aquino played Engage to search out Widow Anchor and draw a card. he used the Widow Anchor to steal Sliprider, then used Area Zero to send it to the Graveyard and add another Widow Anchor to his hand. Multirole sent Area Zero to the Graveyard, and Aquino Special Summoned Raye. He Set two back row cards, and in the End Phase Multirole put Widow Anchor and Area Zero face-down on the field. Vang drew Tincan and gained 1000 Life Points with Forerunner. He played Strawman and had it target his banished Dark Destroyer. Aquino Chained Raye’s effect, then Chained Widow Anchor to negate Strawman. Raye’s effect Special Summoned Shizuku. Vang sent Dark Eclipser to destroy Shizuku in battle, and Aquino protected it with Eagle Booster. Forerunner also attacked Shizuku. Aquino used Multirole to Set Eagle Booster and Engage, and Shizuku added another Engage to his hand. Aquino flipped up Area Zero, then activated Engage. He added Eagle Booster to his hand and drew a card. He used Shizuku to play Hayate. He then played Hornet Drones and used the Token to play Kagari, adding Hercules Base to his hand. Kagari attacked Strawman, then Hayate attacked directly. Vang had only 200 Life Points remaining! Aquino used Multirole to send Kagari to the Graveyard, then Set one card in his back row. Vang drew Artifact Sanctum. He gained 1000 Life Points with Forerunner, then sent it to attack Hayate. Aquino used Eagle Booster to protect it. Dark Eclipser attacked as well, leaving Aquino with 1100 Life Points. In Main Phase 2, he Normal Summoned Tincan, and Set Sanctum. In the End Phase, he paid 500 Life Points for Tincan and Aquino flipped up Infinite Impermanence to negate it! Aquino used Multirole to Set Eagle Booster. Aquino played Hercules Base, then used Multirole to send it to the Graveyard. Hercules Base added three of his Link Monsters back to the Extra Deck. He went to the Battle Phase and attacked directly with Hayate. Vang used Artifact Sanctum, hoping to get Artifact Moralltach, but Aquino had Ash Blossom & Joyous Spring to negate Sanctum! Vang began with Artifact Moralltach, Artifact Sanctum, two Kozmo Tincan, and Kozmotown. He played Kozmotown and shuffled a Tincan back into the Deck to draw Back to the Front. He Set Sanctum, Moralltach, and Back to the Front. He played Tincan and used the effect, and Aquino negated it with Ash Blossom. Aquino played Reinforcement of the Army to get Raye. Vang then flipped Sanctum and Special Summoned Artifact Scythe, and Aquino negated Scythe with Widow Anchor. Twin Twisters came next, discarding Metalfoes Fusion and destroying Back to the Front and Moralltach. Vang Special Summoned Moralltach. Aquino played Raye and attacked Tincan, then used Raye’s effect to Special Summon Hayate. It attacked directly and sent Engage to the Graveyard. In Main Phase 2, he used Hayate to play Kagari, adding Engage to his hand. He activated it to get Afterburners and draw a card. Afterburners destroyed Scythe, then Metalfoes Fusion let him draw a card. 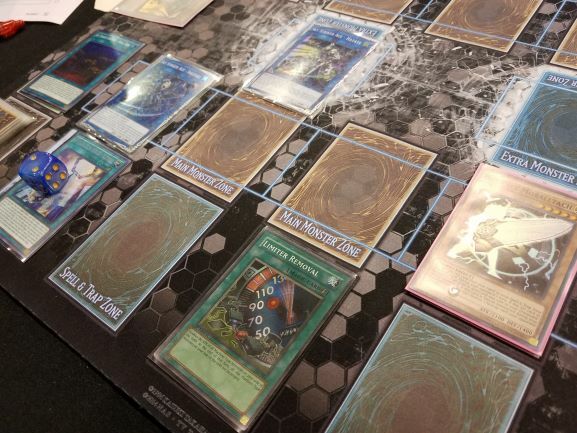 He used Kagari to play Shizuku, Set one back row card, and used Foolish Burial Goods to send Metalfoes Fusion to the Graveyard. Shizuku’s effect added Multirole to his hand at the end of the turn. Vang drew Tincan and Normal Summoned it. He used its effect, and Aquino flipped Shared Ride. Tincan’s effect added Kozmoll Dark Lady to Vang’s hand, sending Dark Destroyer and Forerunner to the Graveyard. Aquino played Multirole, then used Shizuku to play Kagari. He got Engage and activated it, getting Widow Anchor and drawing a card. Terraforming was next, for Area Zero, and he activated it. He used Kagari to play Hayate, then used Widow Anchor to take control of Moralltach. He Normal Summoned Raye and Link Summoned Shizuku. Moralltach attacked, and Vang banished Tincan to play Dark Lady in Defense Position. Moralltach destroyed Dark Lady, then Aquino played Limiter Removal! He sent his boosted Hayte and Shizuku to wipe out Vang’s Life Points! Carlos Aquino is victorious with Sky Strikers!